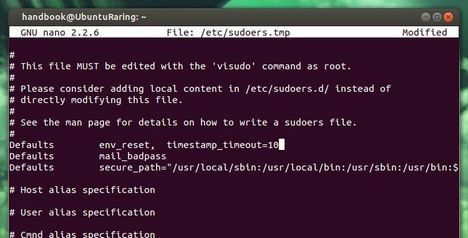 As you may know, when you’re running commands in terminal with sudo at beginning, you have to enter user password to get past. Within a certain time, you don’t need to enter the password again to run another sudo command. The default timeout is about 5 minutes, here’s how to change it in Ubuntu 13.10, Ubuntu 13.04, Linux Mint and Elementary OS. Replace 10 with other number of minutes as you want. After that, press Ctrl+X and followed by Y to save the changes. Thanks for the password time out on my Mint 16.